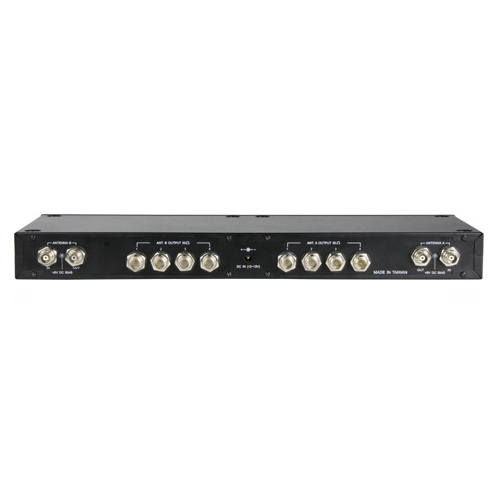 The AD-708 is designed to work with an MPB-30 gain-controllable antenna booster to detect the signal loss to control and compensate for the signal loss of antenna cables precisely and automatically in order to avoid the intermodulation caused by the higher gain supply from the booster. The users don’t have to worry about the calculations of signal loss of antennas and cables or booster specifications. It has a bright LED indicator to identify antenna cable signal loss as well as the booster compensation status. 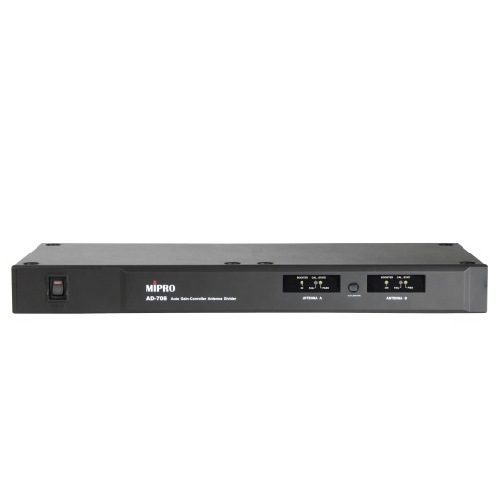 It is an ideal device for the multi-channel receiver installation in EIA standard cabinets. AD-708 shares the same features with the AD-707a wideband antenna divider and is compatible with the MPB-20 to compensate for the signal loss of cables, but cannot change the gain of the boosters themselves. Equipped with an automatic signal loss detector, the AD-708 is designed to work with an MPB-30 gain-controllable antenna booster. It can control and compensate for the signal loss of antenna cables precisely and automatically in order to avoid the intermodulation caused by the higher gain supply from the booster. It shares the same features with the AD-707a wideband antenna divider and is compatible with the MPB-20 to compensate for the signal loss of cables, but cannot change the gain of the boosters themselves. The AD-708 is housed in an EIA-Standard 1U metal case with a bright LED indicator to identify antenna cable signal loss as well as the booster compensation status. It makes it fast and easy to install antenna systems without worrying about the calculations of signal loss of antennas and cables or booster specifications. Input / Output Connectors 2 sets of 1-to-4 active divider outputs; 2 sets of 1-to-1 active outputs. TNC female. 50 Ω Impedance. Signal Loss Detection Detects the signal loss of the cables automatically.